Richelieu Rock is regularly listed in the world’s top 10 dive sites. With everything from Whale sharks to Seahorses. 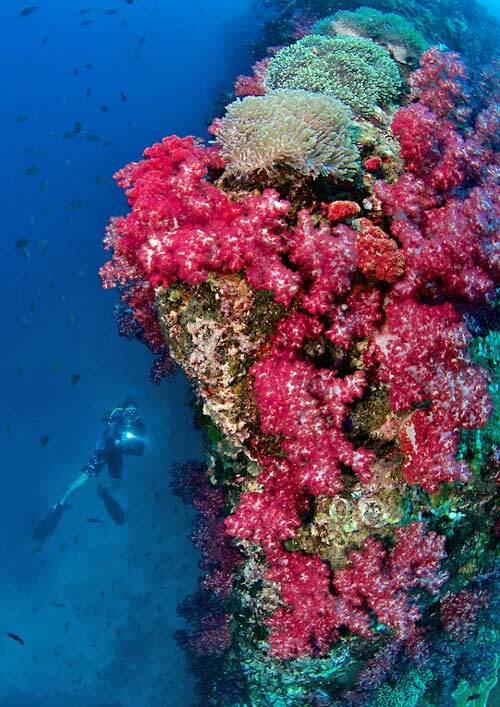 Set on a backdrop of pristine pink and purple soft corals and surrounded by huge schools of fish. Richelieu Rock is undoubtedly the best dive site in Thailand. The history of Richelieu Rock has, until now, been vague and inconclusive. Read the featured article below to find out an honest answer to the question; Who was Richelieu? Richelieu Rock lies 18KM East of the Surin Islands, 39KM North East of Koh Tachai and 38KM West of the Thai mainland. In short, Richelieu Rock is a long way from anything. At high tide the rock is completely submerged and conditions can sometimes be slightly challenging. Richelieu Rock is not always suitable for all levels of divers, so if you are unsure of your experience level then please contact us for more advice. However, this is undoubtedly the best dive site in Thailand and usually the best dive on a Similan Liveaboard. If you only do one dive in Thailand, make sure its at Richelieu Rock. Richelieu is a single rock structure in the middle of nowhere. At low tide it is just visible from the surface and at hight tide it is completely submerged. The common Thai name ‘Hin Ploo Naam’ literally means ‘rock rising from the water’. It is beautiful from top to bottom. The coral and marine life here is unparalleled at any other dive site. A Thailand diving holiday is not complete without stopping here. If you want to dive with a Whale shark then Richelieu Rock is one of the best dive sites in Thailand. What better place to see one than in an area surrounded by such beautiful colour and life. However, a Whale shark encounter is not a certainty. They are listed as a vulnerable species and their numbers are in decline. Between January and April is a good time to visit, but you will always need a little bit of luck on your side. Tomato anemone fish, Harlequin shrimp, Ornate ghost pipefish, Tigertail seahorses, Pineapple fish, Frogfish, Tiger egg cowries, cuttlefish, octopus and dozens of nudibranchs. Just a few of the smaller reason why one dive at Richelieu Rock is simply not enough. Combine this with stunning corals, schools of Fusiliers, Barracuda, Trevally and maybe a Whale Shark or two. You will wonder why you need to dive anywhere else. It is difficult to pick just one highlight at Richelieu Rock. The list of marine life you can potentially see is very long, and you will probably not see it all. Species like the Tomato clownfish always live in the same bubble anemone. But Seahorses, Harlequin shrimp, ghost pipefish and many other species come and go throughout the season. For experienced divers that want to see something specific, it is best to discuss it with your divemaster beforehand. Try to dive with an experienced guide that has worked in the area for a while. If you have any specific questions about the dive site then feel free to contact us. One large, arc shaped, limestone rock rises from 35m up to the surface. Several smaller and deeper pinnacles are all close to the main rock. The sandy bottom quickly slopes away from the pinnacle to over 40m. Richelieu Rock is very exposed, so it can be difficult to get to. Occasionally day trips are cancelled, and in the harshest weather conditions, Similan liveaboards cannot get here. Contact us to find out the best time to dive here. With so much to see here you will want to use every lens you have. Fortunately, both day trips and Similan liveaboards typically do at least two dives here. This gives you enough time to experiment with different photography styles. This is the type of dive site that was made for Nitrox diving. Some Similan liveaboards do up to three dives here. As most boats like to leave before dark, this can mean you do a lot of diving with relatively short surface intervals. 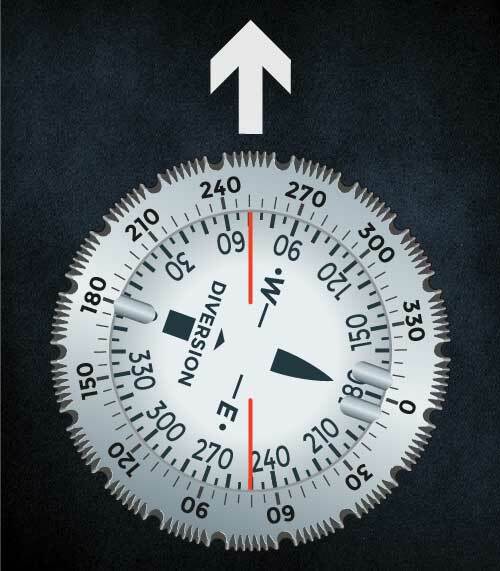 Diving on air, your no decompression time will keep bringing you up to the same shallow areas halfway through every dive. On Enriched Air Nitrox (Eanx), you have enough time to explore all the deep areas of the dive site that it is not possible to see on one dive. If you have never dived on Nitrox before, it is possible to do the course on most liveaboards. Double check you are booking on a dive boat with Nitrox capabilities. Liveaboard diving is the best way to experience the Similan Islands. Trips range from a single night to a full week on board. The optimum time to see all of the best sites is on a 4 night Similan Liveaboard including Richelieu Rock. You are likely to do more than one dive here, so you will probably swim several different routes around Richelieu Rock. The route can depend on which direction the current is traveling, what special marine life is currently known on the site and also you diving experience and air consumption. The route we will focus on here is assuming no strong currents. It is fairly common to dive around the North side of Richelieu Rock first, as this is the deepest part of the dive site. Jump in near the only buoy line on the South East. Hold onto the line to make your descent easier and this will bring you down to around 14m. Once you are near the rock, you can let go of the line. Even if there are strong currents, there will always be somewhere on the site that is protected, as the rock rises so close to the surface. If the current allows then swim to the far East and start to head North. The picture below shows the steep wall on the East side of Richelieu Rock. Notice the soft corals and anemones sitting on top. Try to spend some time on top of Richelieu as the colour is astounding. For experienced divers using Nitrox, swim out to the deeper pinnacle at the far North East. This smaller pinnacle is between 25m-35m, but the soft coral is even denser and more beautiful than the rest of the dive site. Once you are finished, turn back South West to the main pinnacle. Keep heading West along the North wall. Look out into the blue for schools of Barracuda, Trevally and Jacks. Closer to the pinnacle are the large schools of Bigeye Snapper which you can swim straight through. Keep your eyes open for all the smaller creatures. There are plenty of Peacock Mantis shrimp, white eyed Moray eels, nudibranchs, tomato clownfish and much more. Usually there will be one or two Tigertail Seahorses somewhere on the North side. Check with your divemaster for where they have been most recently spotted. The same is true for Ornate Ghost pipefish, pineapple fish and frogfish. If you have a good eye, you might find them for yourself. Follow the North wall all the way round to the West side. If you keep swimming around you will eventually reach the shallower bay in the South. The shallow bay is a good place to look for Harlequin shrimp. Harlequin shrimp are very small so it is usually easier to look for their food. They cut off seastar legs and bring them back to their hiding place. If you see a single seastar leg (red or blue) on the sea floor, there is a good chance that a Harlequin shrimp is close by. You can keep shallowing up towards the end of the dive as there are still things to see in the shallows. Sometimes large lobsters are seen in the cracks on top of Richelieu rock. Cuttlefish are often seen mating or laying their eggs in a small hole somewhere. Big reef octopus can also be seen sitting on top of the pinnacles. The variety of life here is unparalleled in Thailand and there is always a good chance that you will find something you have never seen before, no matter how experienced you are. Lastly, remember to listen for other divers banging on their tank. If you hear frantic tank banging, there is a good chance that a Whale shark has made an appearance somewhere around Richelieu Rock. Use this route at slack tide or when current is not too strong. Try to start your dive by heading to the North side of the dive site as this is the deepest part of Richelieu Rock. If you are diving on Nitrox, you can swim out to the deeper pinnacles on the North East side. After this start to shallow up and continue heading West along the North wall. Follow the rock clockwise around the dive site until you eventually come back inside the shallow bay on the South. The bay is one of the best places to look for Macro life like Harlequin Shrimp and Ornate Ghost pipefish. Stay in the bay until you start running low on air or deco time. If the current is strong from the North then spend most of the dive in the protection of the South bay. Use this heading from the buoy line to cut across the bay. Swim back to the buoy line for the safety stop. If your Similan liveaboard is on the line then stay put. Otherwise allow the current to let you drift away from the dive site. Heres how the story goes. Jacques Cousteau arrived in Thailand and asked the fisherman where all the fish were. They told him about a rock in the middle of the Andaman Sea and this is how he discovered the now famous dive site. Returning from the dive, Jacques exclaimed that the rock looked like it had been ‘draped in the robes of a cardinal’, referring to Cardinal Richelieu. This is the most common theory of where the name Richelieu rock came from. To be fair, this does sound very much like something Cousteau would say. Jacques Cousteau, the inventor of the Self-Contained Underwater Breathing Apparatus (SCUBA), did a lot of amazing things in his lifetime. However, naming Richelieu Rock was not one of them. The picture below is taken from a US Army map in 1960. The rock is already clearly labelled. 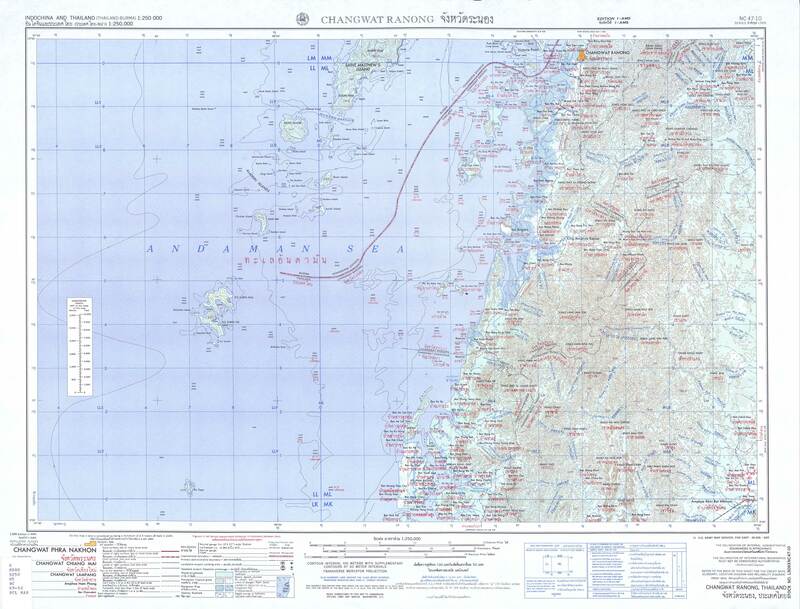 If Cousteau was to have named the dive site, and had it officially recognised by both the Thai government and the US army, he would have needed to do so before 1960. Jacques Cousteau was a brilliant and busy man. He had plenty of other more important things on his mind than going to the trouble of officially naming dive sites in foreign countries. The 1960 US army map below should hopefully draw a line in this widely believed story. 1960 was also an important year for Jacque Cousteau. He appeared on the cover of Time Magazine and the article detailed all the amazing underwater achievements he had made until this point. The article tracked Cousteau’s invention of open circuit demand scuba in 1943, his work with the French Navy until 1949 and his first expeditions on the Famous Calypso boat they first leased in 1950. His first official movie release was called ‘The Silent World’ and released in 1956. It was a truly groundbreaking movie that had the entire world in awe and fired him to International fame. However, In all this time there was never any mention of Thailand. Jacques Cousteau and the Calypso did eventually visit Thailand, but not until 1989. He visited the Similan islands, Koh Bon, Phang Nga bay, Ban Nam Khem and the Gulf of Thailand. This expedition appeared in a wonderful documentary called ‘Convicts of the Sea’. Screenshots and quotes from the movie are shown below. Jacques Cousteau clearly had some beautiful things to say about the Similan islands. But there was never any mention of Richelieu Rock. If he did ever dive there, which is very possible, he certainly did not name it. So who was the real Richelieu? We need to go back a little bit further than 1960 to find out. Before the boundaries of modern day Thailand were formed, Siam was a much larger country. It included virtually all of modern day Cambodia, Laos and also parts of Myanmar (formerly Burma). During the colonial era, the English were encroaching from the West and the French from the East. Siam was shrinking. The King of Siam, King Chulalongkorn, needed to take drastic action. Fortunately, he was a smart man, and played the game well. Enter the Danish naval officer; Andreas Richelieu. Towards the end of the 19th century, many westerners made their fortune from trading goods in the far east and sending them back to Europe. The entrepreneurial Richelieu saw an opportunity of his own and asked for an introduction to the Siamese king in order to increase his influence in Asia. Andreas Richelieu traveled to Siam and became a close friend of the King. Siam was surrounded by the British to the West, the French to the East and the Dutch to the South. King Chulalongkorn was no stranger to the ways of the West. He traveled to Europe many times and sent his children to study in England. He abolished slavery in Siam and unified all the provinces to be accountable to a new central authority in Bangkok. He appointed Richelieu as a Siamese commander in the Thai Navy. 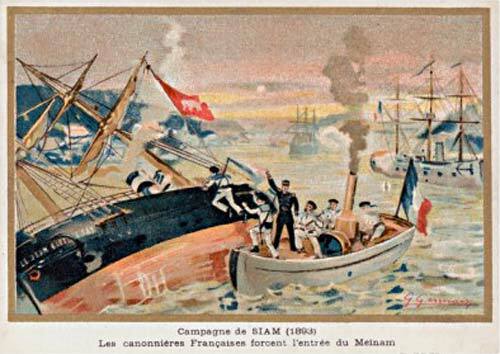 Richelieu defended Siam against a French invasion known as the Paknam incident, illustrated below. This battle was unquestionably a defeat for Siam. Their ships were far outclassed by the much larger and more modern French gunboats. The King knew he had to modernise his navy and this is when he turned to Richelieu once again. In 1900, King Chulalongkorn appointed Andreas Richelieu as the commander-in-chief of the Royal Navy. He is still the only foreign born commander-in-chief the Thai Royal navy has ever had. One of Richelieu’s tasks would have been to modernise the outdated navy charts. Way out to the East of the Surin islands was a large rock poking out of the water that posed quite a hazard for ships. As Richelieu became such an important and influential figure in Thailand, the rock was later named after him. We wonder if he knew how beautiful it was below the surface. To all historians, cartographers, geologists, marine biologists, conservationists or any other specialists in your field, we would love to meet you. If you can help us increase our knowledge of the places we love, then we can help you dive there. At Scuba Diversion we are leading exclusive research and conservation trips with the Marine Megafauna Foundation. We aim to discover new Manta Ray aggregation sites in the far North of Myanmar’s Mergui Archipelago. We also have other future projects that still need funding. We are always looking for something exciting and new to explore. If you have knowledge or experience to share with us, we would love to share ours with you. Feel free to contact us. The one and only. The amazing Richelieu Rock!